As anyone working in asset management can tell you, data is extremely important. In order to stay competitive, you need reliable data that’s easily accessible. But, without the right technology, you won’t be able to take full advantage of the data that’s available to you. In this video series, we look at the 6 common areas where Artificial Intelligence (AI) can make a huge difference in the daily operations of an asset management firm. With AI, your firm can increase profits, streamline processes, and keep a competitive edge. If you are just now joining us here in part 3 in our video series, be sure to take a look at the introduction, 6 Ways Asset Management Firms Can Benefit from Artificial Intelligence; part 1, Managing Wholesaler and Retailer Lines of Business; and part 2, Managing Pipelines and RFPs. In this video, we look at the ways AI can help wholesalers when it comes to planning trips. Traveling as a wholesaler is a demanding, time-consuming process—which is all the more reason to ensure that every itinerary is as efficient as possible. The question is, how do wholesalers know which accounts to visit? Keep reading this post or take a look at the video below to find out how machine learning and AI can help your asset management firm make trip planning decisions that are more profitable, objective and efficient. Who to Visit When Planning Trips? Take an example: imagine that a wholesaler is planning a trip to Atlanta. Maybe they’re visiting an at-risk account or a prospect that’s nearly converted. Obviously, it seems sensible to visit other accounts in the area, too -- but if you have dozens of accounts in Atlanta and surrounding areas, which ones should your wholesaler prioritize for a visit? In the best case scenario, your wholesaler will put together an ideal itinerary that includes the most profitable clients, or perhaps the prospects that need a little nudge in order to close. But, wholesalers are only human and that is likely not the case. Instead, they may prefer to visit the accounts they’re most familiar with, or they may choose to avoid difficult accounts. With machine learning and AI, a wholesaler’s itinerary is planned in an objective way. By utilizing your firm’s data, AI tools can put together the most efficient and effective trip plan possible. This in turn will allow your wholesaler to visit the right, or dare we say the best, combination of clients in Atlanta. It may sound futuristic, but AI isn’t some distant future technology. 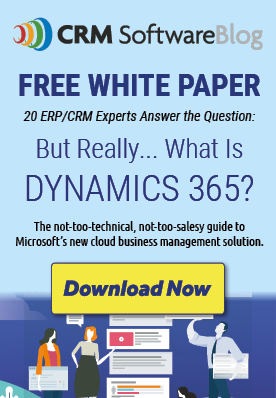 In fact, it’s available as a feature of Microsoft Dynamics 365 CRM. Using the power of AI, you can maximize your time and profitability. Check out the video below to learn more about how machine learning and AI can help your business meet the challenge of trip planning, and be on the lookout for future videos in our AI for Asset Management Firms series.